CHILDES corpora are comparable corpora made up from transcripts of child language. Most of these transcripts record spontaneous conversational interactions. Often the speakers involved are young monolingual children conversing with their parents or siblings. Corpora also comprise transcripts of bilingual children, older school-aged children, adult second-language learners, children with various types of language disabilities and aphasics who are trying to recover from language loss. 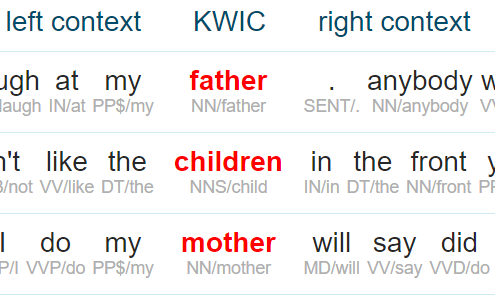 These corpora belong to the child language project within the TalkBank system that was created for sharing and studying conversational interactions. Current CHILDES corpora in Sketch Engine include 24 languages. CHILDES corpora are accessible to users with a paid subscription, see our price list. The following list of CHILDES corpora contains link(s) to the particular corpus pages with detailed information. Each corpus page has the link Download transcripts to a zip archive containing a file called 0metadata.cdc where are stored all metadata of the particular corpus. Sketch Engine offers a range of tools to work with the CHILDES corpora.